When the Gillard Labor Government announced, in response to the 2012 Queensland floods, that the Australian Learning and Teaching Council (ALTC) was to be abolished to save $88m over the forward estimates, many in the sector rallied against the withdrawal of, what was even then, a small investment in necessary R&D for Australian higher education to innovate (0.1 per cent of gross revenues). Fortunately in 2012, Independent Tasmanian MP Andrew Wilkie was persuaded by colleagues at UTAS to intervene. A deal that he brokered saw $54m saved out of the ALTC’s execution and the Office for Learning and Teaching (OLT) was born. Now the Abbott/ Turnbull government has decreed that the OLT shall close its doors from 30 June 2016 and that even the meagre $28m that was promised to establish a new National Institute, as recommended by its own commissioned expert report (the Milbourne Report), is not worth investing. $88m to $54m to $28m to $0. That is what strategic investment in educational innovation for a world class education system, that is incidentally Australia’s largest service export, is worth to our federal government. The sector has again rallied in 2016. But this time, it is not just the usual suspects. Embarrassingly for the government, its core NISA constituency – the Deans of Science, the Deans of IT, the Deans of Engineering, two Nobel Laureates and the Chief Scientist who spoke at the recent OLT Conference in April 2016 – has also called on the government to continue its critical, system-wide investment in the quality of student learning and higher education innovation. They make a simple point: the massive cultural change that is implied by NISA needs to be matched by assured and continual change and innovation in L&T. Unlike research grant funding, where the top eight universities receive around 70% of competitive funding, Professor Margaret Gardner points to the extraordinarily broad range of institutions that have received L&T innovation and excellence funding (2006-2014) and OLT grants and fellowships funding (2012-2015). Unlike research grant funding, every single ALTC/OLT grant and fellowship is evaluated for efficacy and is publically available for creative commons re-use. Enhancing graduate employability and the quality of work integrated learning. #OLTphoenix and the diverse contributions collected below condemn the government’s “complete abdication of federal involvement in providing the ‘carrot’ for improving learning and teaching in universities…[which is] set in sharp relief to the rhetoric of successive Governments that rant about the importance and centrality of graduate outcomes and quality” (Professor Carol Nicoll). And in sharp relief to research incentivisation. Take the foot off the pedal in this globally competitive sector and Australia will fall behind all too quickly. Our bygone reputation for educational excellence will count for little in the face of aggressive investment internationally and constant sector and technological disruption. This is no passing fancy. A national innovation and ideas strategy is unsustainable without parallel investment in innovative education. We will continue to call on successive governments to invest in Australia’s students, its future graduate workforce and the associated economic productivity uplift. Let’s call it an independent National Academy for Graduate Success. Who wouldn’t want one of those? 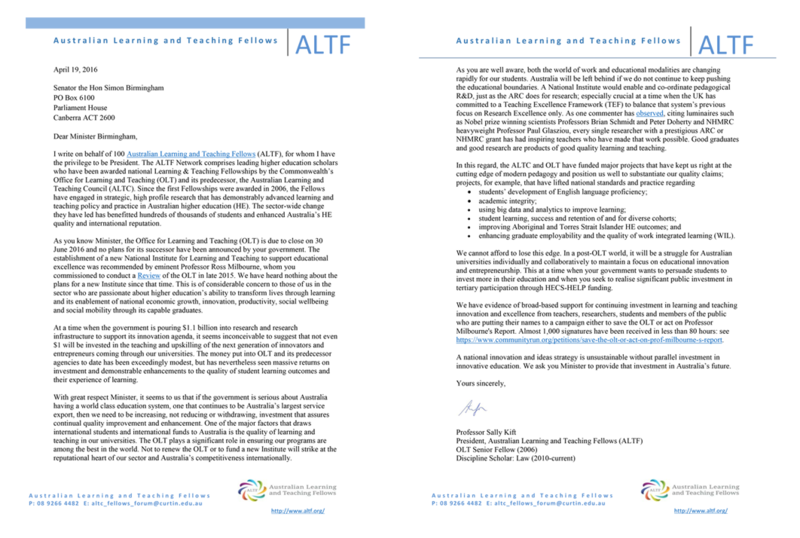 Letter of support from Associate Professor Dominique Parrish – President, Australasian society for Computers in Learning In Tertiary Education (ASCILITE), 26 April 2016. Response letter from Di Weddell. Published articles are reproduced with permission.